Mom's Gone Bronson! : Honest Teas, Honest Fizz and Honest Kids! Look-See! Honest Teas, Honest Fizz and Honest Kids! Look-See! Disclaimer: I was provided with products in exchange for my honest opinions. Your views may differ from mine! HONEST beverages have been around for over 15 years, which is an incredible feet that started humbly by co-founders Seth Goldman and Gary Nalebuff, who just wanted to fill a void and produce a thirst quenching product, low in all the bad things and yet filled with taste! 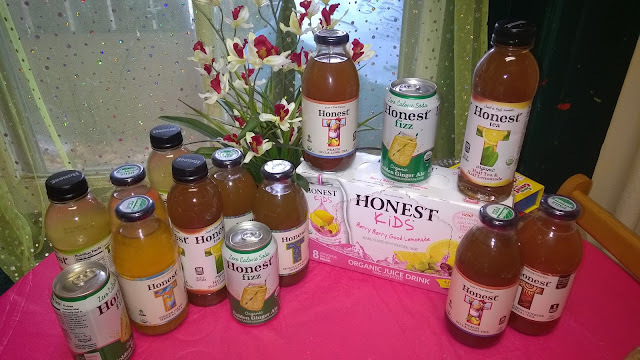 Purchased by The Coca-Cola company in 2011, Honest Tea is now run as an independent business unit with HONEST TEA, HONEST KIDS and HONEST Fizz, all of which I have had the chance to try and to share with family and friends over the past couple of weeks! I do like the fact that there isn't a ton of sugar in these drinks and yet there is taste that we can still enjoy. In fact, I don't like mint tea, usually, but I really do love Honest Tea's mint tea and the rest of the flavors are light and yet still quench a thirst. My 19 year old son enjoyed the Ginger Ale Honest Fizz drinks and my 2 youngest children were very fond of the Berry Berry Good Lemonade, all of which are organic and healthier than some other drinks currently on the market! With Radiant Raspberry and Moroccan Mint, plus other fabulously named teas, you can find something you'll like to suit your personal flavor - how about taking a look at some of them on their website, starting with the tea's HERE! For more information on the full range of beverages available, you can peruse the website and keep a look out for new info through social media with Twitter, Facebook and more! Quench your thirst, with a smile - and break some out over the holidays!